It has been several months since I last wrote, ( I have to be honest, I lost my password to this site). 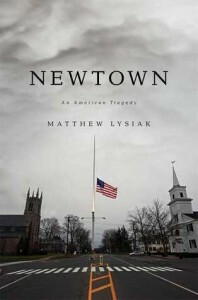 But several months ago I read the book, “Newtown: An American Tragedy” by Matthew Lysiak. A journalist like myself, he spent several months following the attacks learning all he could about the tragedy. I read this book in less than 24 hours, it was a great book, with the exception of a few mistakes the author made since he wasn’t from Connecticut or checked his facts regarding the area in which the tragedy took place. I read it because I wanted to know more than what I already knew about this horrific event in our nation’s history. I was one of many journalists living in Connecticut during the time of the shooting that reported on it. I still remember that day like it was yesterday. I was actually at home the day it happened, just had my morning coffee, I was on Facebook when the news broke. Of course, I immediately called my editor ready to do what was needed to cover this story. My editor had me stay back (I think to protect me from what I was going to see and hear about this tragedy) my two co-workers were the first in our company to cover the story, while I stayed back and covered anything that was needed for social media. At the time we didn’t realize how big of an event this actually was, news was coming out in pieces, the numbers of victims were growing and news crews from all over the country wanted a piece of this story. This small town had now become the focus of everyone’s conversations and fears, laws were being created to prevent a horrific situation like this from happening again in another school. Sometime during that morning when I had heard the principal had been shot and killed and news reports had released the name of the principal, I realized I knew her. I had interviewed her numerous times when she had been in another school district before Sandy Hook Elementary. I had heard her give several presentations during board of education meetings, I wrote the story about her leaving the school district for Sandy Hook. It was a shock to the system to know that this woman I had seen so many times had been brutally murdered by senseless sick individual. Like I said earlier in the post, I thought the author did a great job with the book, he paid close attention to detail. What I didn’t care for was hearing about the shooter’s life and his family’s life and who he was. I didn’t believe that much attention should have been given to someone who deserves no glorification whatsoever. I almost felt like the reporter wanted us to hear the shooter’s side, like there was some justification for what he did or that we should as the public feel remorse for him and his family. The shooter and his family deserved none of this. I understand that when writing a story, any story for that matter, you must tell all sides in order to be accurate, but I felt too much time was spent doing this. I found myself skipping chapters here and there. I didn’t want to hear about the mother or her son. I read the book because I wanted to see how accurate the story would be told, would the author/reporter leave anything out, would he be gracious to this small town that had everyone’s eyes on them for several months. I do believe he tried his best to tell the story the way he knew how. After the shooting that cold December morning, we immediately (my fellow co-workers and I) went to work. I wanted to do a story about the principal since I knew so many of her friends and former co-workers in the district I covered. My co-workers covered other aspects of the story, clarifying rumors that had circulated, trying to get in touch with family members of victims and so on. While many believed that the media had intruded on this small town, some of us did our best to be respectful despite what the public wants to believe. While so many of us thought it was crazy to see people like Anderson Cooper standing in a town no one would ever know about if it wasn’t for this tragedy, as Connecticut reporters we felt we needed to tell the story because Connecticut was our home.